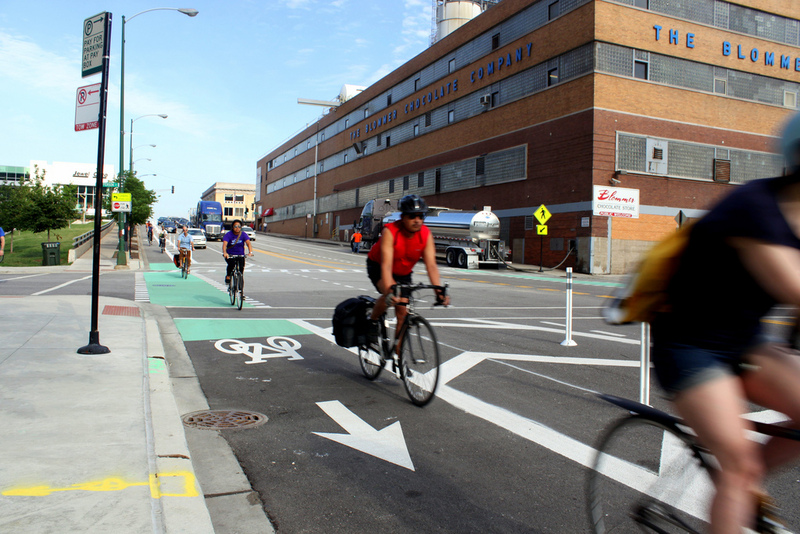 Bicycling is at a tipping point in many American cities. Bike-share systems are multiplying rapidly, infrastructure that used to be seen as novel is now commonplace, and commuting rates are growing. There are many explanations for this cultural shift, but here’s one not to be ignored: federal funding. Georgetown Public Policy Institute student Marissa Newhall posits in her master’s thesis [PDF] that there is a statistically significant correlation between per-capita bike-ped funding from the federal government and a city’s bike commute rate. The finding comes at a time when federal bike-ped funding programs are 20 years old and have poured $8.5 billion — a tiny fraction of overall transportation dollars, but not an insignificant sum of money — into reshaping American streets to accommodate non-motorized transportation. But these programs face an uncertain future. The current transportation bill slashed spending levels by anywhere between one-third and two-thirds, depending on how states use the money. Given what we know about the benefits of cycling for cities – saving money, reducing congestion, improving health outcomes, clearing the air – Newhall wanted to do an audit of what federal bike-ped funding has accomplished over its first two decades. As we have frequently lamented on this blog, the state of statistical data on bicycling and walking leaves much to be desired, and Newhall emphasizes that this was a master’s thesis, not a funded dissertation she had years to conduct. Her sample size was small – she looked only at the country’s 51 most populous cities. Plus, the years she looked at – 2007, 2009, and 2011 – were anomalous years, which included a Great Recession and a stimulus that dumped unprecedented dollars into just about everything, including bike-ped infrastructure. Bike commuting rose two full percentage points between 2007 and 2009 in those 51 cities, before the stimulus money was even spent, because of the combined impact of the economic downturn and high gas prices. That said, per-person federal investment in a city’s bicycling infrastructure is another major factor not to be overlooked. “Each additional dollar of bicycle and pedestrian infrastructure spending per capita will increase a city’s bicycle commuting rate by 0.047 percentage points, on average and holding other factors constant,” Newhall reports. To have such an impact, she says, the funding should be allocated according to population size. Bike commuting rates increase with federal investment. 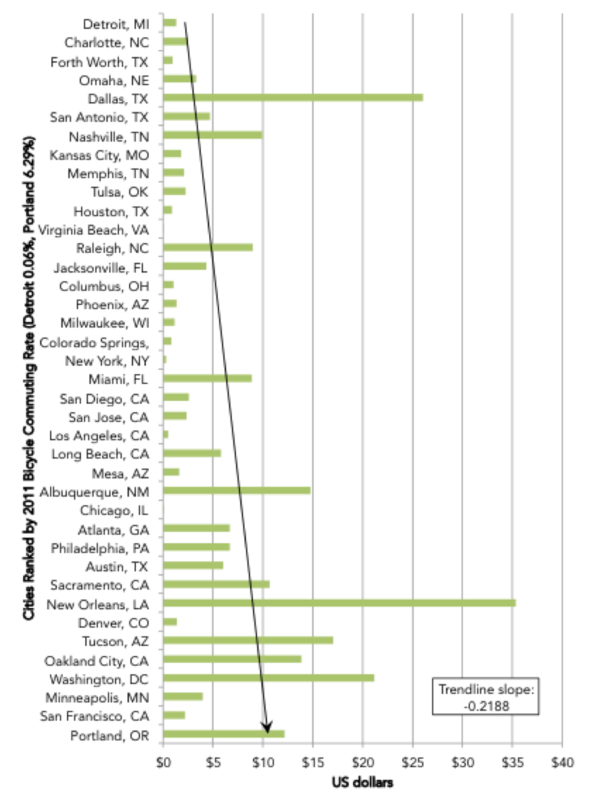 Here, 2009 federal funding correlated with 2011 commuting levels. Image courtesy of Marissa Newhall. In the 2009 “Averagetown,” one extra dollar for each of the city’s 960,820 residents would generate 749 new bicycle commuters, a 17 percent increase. “Cities in my sample that received higher amounts of funding per resident, regardless of the total amount of funding received and holding other factors constant, have higher shares of bicycle commuters,” Newhall said. Federal allocations don’t translate directly into city expenditures, especially given the current protocol of Transportation Alternatives funding. Money is doled out to states based on a formula that includes things like total lane-miles and vehicle-miles traveled, rather than on population. States can freely squander up to half of their federal bike/ped money on other projects, and some is often rescinded when states have to return a portion of their federal allotments. Plus, states and cities can also spend their own dollars on bike and pedestrian projects, if they choose. None of this is included in Newhall’s analysis. “I wanted to start at the source,” she said. It’s important to remember that while federal investment matters, it doesn’t take huge amounts of money to make a big impact. Portland, Oregon, one of the bike-friendliest cities in the United States, famously built its entire bicycle network for the cost of building one mile of four-lane highway. Plus, bicycling has reached a tipping point. Lots of other factors, like high gas prices and cultural acceptance, won’t reverse even if federal funding dries up. Existing infrastructure will continue to serve riders and encourage new riders for a long time to come. Interesting! I did something very similar for my thesis in 2008 – looking at bike & ped funding relative to walking trips in the 2001 NHTS data. Funding data was from the current Alliance for Biking and Walking Benchmarking report. They had it split by the share of federal and non-federal funding, and the weird thing was that federal funding was not associated with increased walking, but other funding was – I suspected that federal funding was going to fix hazards along major highways where people were walking by necessity anyway, while local funds were going to streetscapes and walkable centers… Federal $ was associated with perception of safer streets. I wonder if federal bike dollars are having a similar effect. bbCXL-???????????? ?????? ??? ???????????????????????????????????1???? ?????? ??? ?????????????????????????????? ?? 2013?????????????????????????? ?? ?????? ?? ???????????????????????????????? If not so anxious that most people would choose foreign purchasing Louis Vuitton Bags.Put aside the different countries and regions of different shopping preferences,Louis Vuitton UK buy Cheap Louis Vuitton hand-selected to not much difference,coupled with the big emphasis on the Chinese market,a lot of style is already the world simultaneous release,so the price is only one factor argumentative.Yes ah,regardless of money or not,who would not want to save money too?Especially the hundreds of thousands,to the less louis vuitton outlet there are thousands of big luxury. louis vuitton outlet 2013 spring quarter Men bags series,fluorescent colors,traditional innovation,louis vuitton sale bags for men inject new vitality.Since the designer Kim Jones added to the luxury brand cheap louis vuitton later,such as louis vuitton outlet online the French veteran hit booster as being a brand new look,young fashion taste can be described as more and more intense. Cheap Louis Vuitton luggage advanced customization services,Louis Vuitton Handbags section where a custom color Haute,is a senior in Louis Vuitton UK means,and the most common in the fashion circle is Haute couture-haute couture.By the designer and fashion boutiques in Paris,louis vuitton outlet must be members of the Association accreditation,an association recognized by the designers just enjoy “haute couture designer” of the title,its haute couture fashion works in order to use the title,and is protected by law. louis vuitton sale 2013 summer series handbags extraordinarily colorful and romantic extraordinary in louis vuitton outlet store,sweet peach pink,temperament dark blue as the main colors,combined with artistic temperament canvas texture printing,filling the art.In addition to flowers outside printing,more classic louis vuitton outlet Logo embossed Logo embossed or similar color as a decoration,cheap louis vuitton filling the big luxury noble gas. ???????? 2013???????????????????????????????????????????????????? ?????????? ???????????????????????????????????????????????????????????????????????????????4??????????? ???????????? ????? ????????? ???????????????? ?